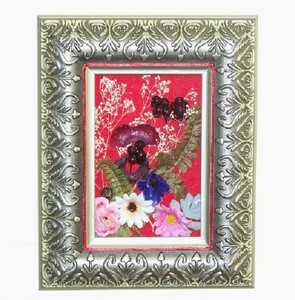 This shadow box is silver with a red velvet inset. The outside of the inset is decorated with red cording. The flowers are pink, cream, and purple. Decorated with baby's breath and ferns it's quite pretty. It does not have a glass front on it. It can be hung or placed on a table like a picture frame. The size is 7-1/4" wide by 9-1/3" high.